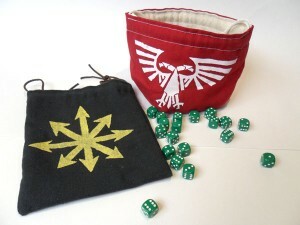 Graven Games posted up a review of Greyed Out Production's handmade dice bags. Personally, I've got an old Crown Royal bag. But these are good, too. Welcome to today’s review in which we are looking at some handmade dice bags available from Greyed Out Productions, a small business based in the US, who sell a range of dice bags aimed at gamers. Michael at Greyed Out Productions kindly sent us 2 of their handmade dice bags for use with our games and we decided to review them as they’re very nicely made and we think they’ll be of great interest Warhammer 40k fans. Ramshackle Games releases Military Command Team?